Flat-plane crank V8 engine and all that. A Ford Mustang by another name: Shelby GT350. When is a Ford Mustang not a Mustang? Answer: when it is a Shelby GT350 (or GT350R). Well, the Shelby is a Mustang, a special version bearing the name of the late Carroll Shelby, a racing driver and automotive designer of renown. Shelby’s name adorned some of the earliest Mustangs, returning in 2006 to do likewise for modern variants. The current iteration indicates neither Ford nor Shelby on the exterior. 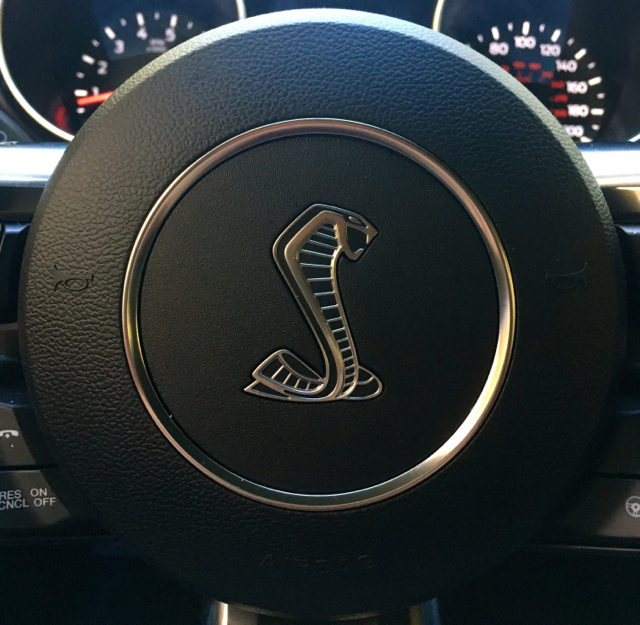 Instead, you’ll find the recognizable cobra insignia. Yes, the Shelby line sits on the top of the Mustang pecking order, just above the GT. If you follow the Shelby line closely, then you’re aware that platform updates follow Mustang architecture revisions, but engineering changes may happen at any time. This means when the current and sixth-generation Mustang rolled out for the 2015 model year, new Shelby models followed. Few mainstream models come with flat-plane crank. This Shelby does. But the Shelby changes happen much faster and typically last only for a few years before an updated model rolls out. 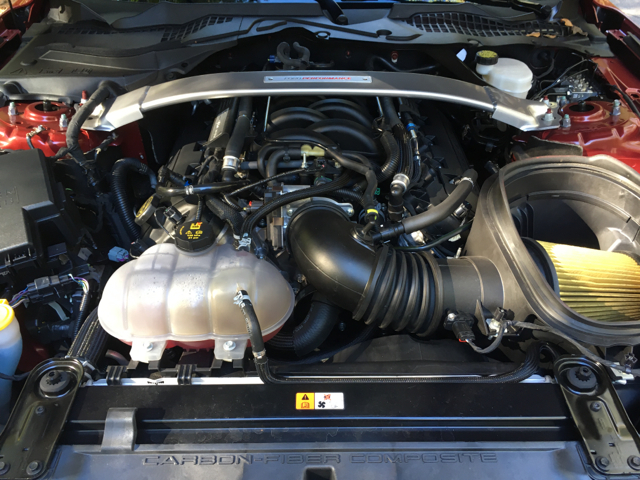 For example, beginning in 2016, Shelby replaced the enhanced version of Ford’s 5.0-liter “Coyote” V8 with a new engine displacing at 5.2 liters. Ford assigned a “Voodoo” appellation to the engine, perhaps to underscore its “magical” properties. Shelby models replace the steed insignia with a cobra. What’s special about this engine, which is also exclusive to Shelby, is that it offers a flat-plane crank. This means the V8 acts more like a pair of four-cylinder engines pushed together, delivering a sequential right-to-left firing order common to racing cars as well as to some exotics. There is a two-fold benefit here: the engine is louder than the typical cross-plane crankshaft and it revs higher — in this case to a whopping 8,250 RPM in the Shelby. A trained eye can spot the differences immediately — the crank pins in cross-plane crankshafts are set 90 degrees to each other, while in flat-plane engines the positioning is 180 degrees. Got it? It took me a while to understand the difference. 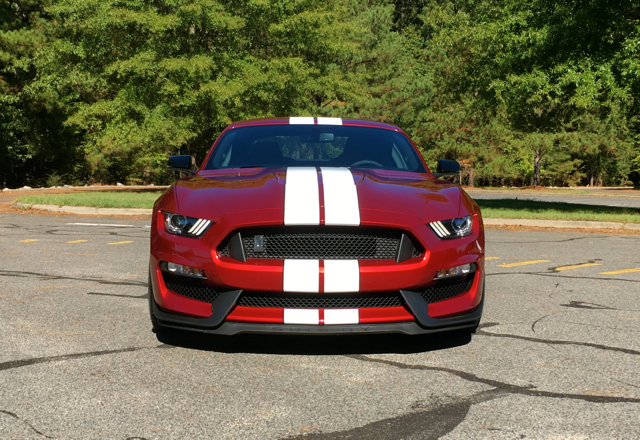 No matter, the GT350 is a beast you’ll want to ride. The burly V8 cranks out 526 horsepower at 7,500 RPM and 429 pound-feet of torque at 4,750 RPM. 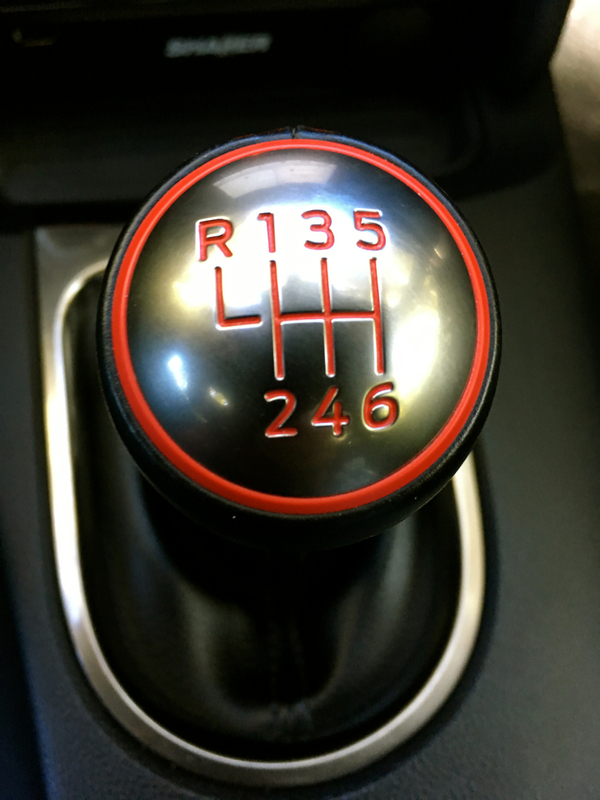 It comes exclusively with a TREMEC 6-speed manual gearbox that shifts like butter — short, quick throws benefit your hand and foot action, although you can easily stay in second gear to reach the coveted 60 mph limit to gauge your times. 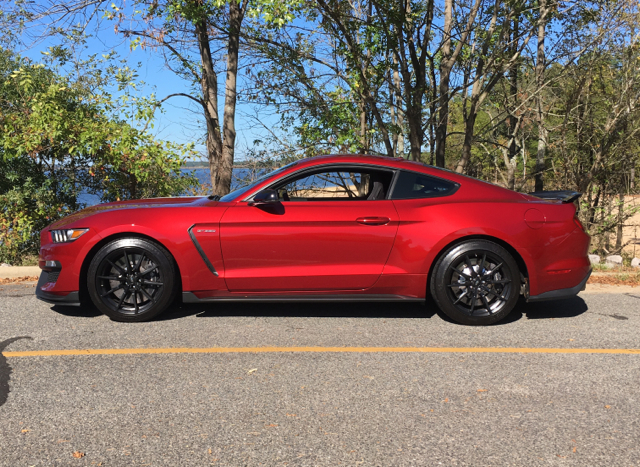 A 0-60 mph time of 4.3 seconds is possible, with perhaps a slightly better time realized in the GT350R as it comes in 130 pounds lighter thanks to such deleted items as the back seat, air conditioning, carpeting along with employing other weight-saving measures. 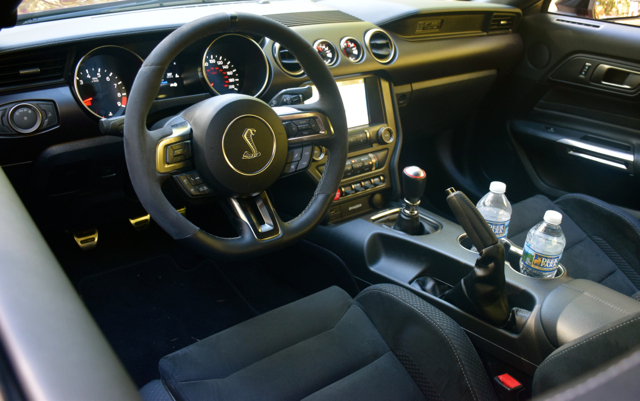 The Shelby serves up a simple, sporty interior. Besides the flat-plane crank, the current Shelby offers an important departure from previous models. Where the earlier ones excelled in all things straight-line performance, this one adds excellent handling. Yes, a muscle car with speed and the adroit handling common to Europe’s finest cars is what this latest Shelby is all about. 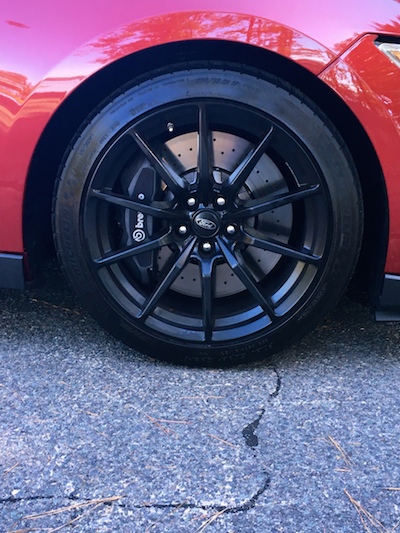 You can thank the Ford Performance engineers for imbuing this coupe with a magnetic suspension, a cross-drilled brake system and ultra-sticky/ultra-wide Michelin Pilot Super Sport tires (surrounding 19-inch painted aluminum wheels) with improving same. Slip behind the wheel and you may notice one thing immediately — the Recaro seats are very firm and strikingly bolstered. If you’re of a certain age, the front seats can quickly become tiresome if you’re not careful. This means spending some extra time adjusting the seat for the right position and height relative to the steering column. 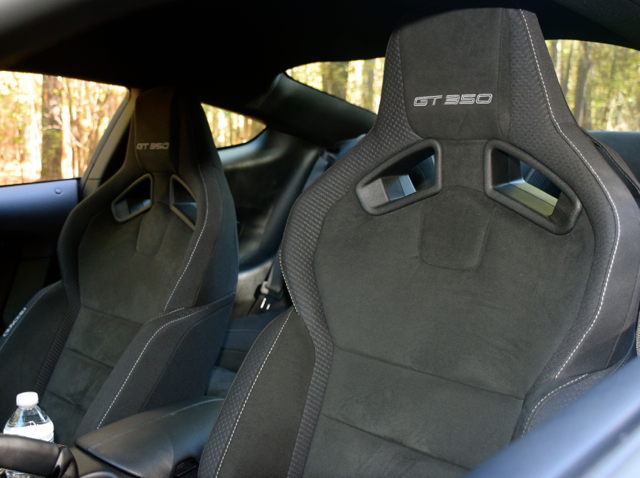 The last thing you want is for your Shelby driving experience negated by Recaro sport seats. The Shelby’s red ignition button is on a panel at the bottom of the center console. 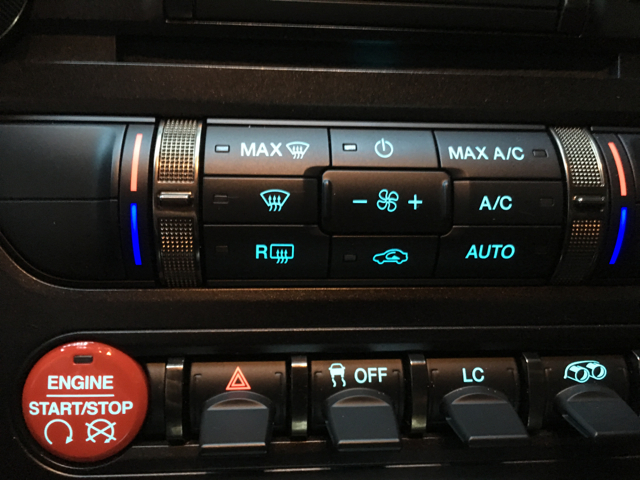 It is immediately followed from left to right with switches for the emergency lights, to deactivate stability control, LC for launch control, and an exhaust note mode — sport or normal. Buckle in, adjust your mirrors, hold down the clutch and fire up the engine. Immediately, you’ll hear a cacophonous bellow as the engine and exhaust unite to put forth the loveliest note. Drink it all in for a few moments before shifting into gear — if it is early in the morning, your neighbors may also take note and may not be a fan of this raucous outburst. Begin moving forward and you’ll immediately notice the clean clutch uptake and smooth gear shifts. Modern manual transmission assemblies vary in usability — the Shelby’s is one of the best ones out there. At the bottom of the center console are four switches of note. To understand what the Shelby is all about, you need to take it to a back road, free from traffic and devoid of police interceptors. En route, the Shelby announces its presence and quickly draws the attention of other drivers. Soon, Camaro, M Series, Corvette and SRT faithful will check you out— some may toot and give you a thumb’s up, while others will roar their engines or challenge you to a race. You know how best to respond! Smooth as butter: TREMEC 6-speed gearbox. My favorite set of twisty roads are about 20 miles from my house. It provides a straight shot for about a mile, followed by another mile of curve upon curve. Then it’s a straight shot for several more miles with the occasional bend before I turn left and begin a wonderful curving dip that takes me across a bridge before suddenly rising again. Many turns later I come to my prized location where 90-degree turns come in pairs — this is where I’m best able to gauge how a car handles. Grip the steering wheel and take note of the sheer “weightiness.” As you turn, you’ll feel much resistance, which also supplies assurance that the steering is deliciously engaging and feedback spot on. Harder and sharper turns come by way of a cross-axis ball-joint connection for the front control arms, offering a vast improvement over the usual bushing-supported arrangement. No, you don’t need to use launch control unless you’re obsessed with achieving and tracking your times. Otherwise, simply rev the engine and release the clutch when you’re ready to go. You’ll quickly shift into second gear and before you make your next upshift, you’ll have already passed 60 mph. 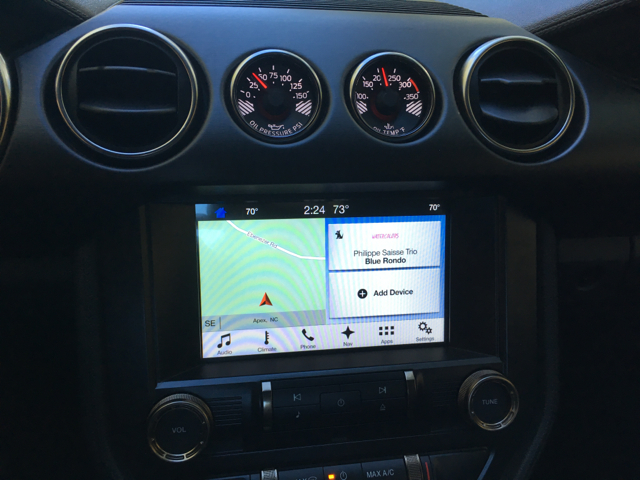 Gauges and an available navigation interface. 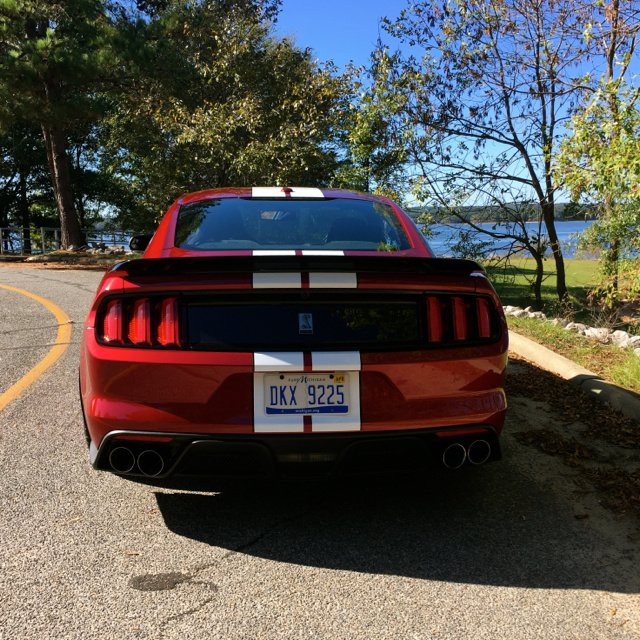 I waited until my second set of twisty expanse to gauge just how well the Shelby hangs in the curves. The “fat boy” tires are a big help as they grip the road with no signs of loosening. That the Shelby sits even lower to the road than other Mustangs helps too. When you enter 90-degree turns, you’ll notice how poised it is with no downshifting or braking required. It is as if the Shelby is eager to plunge into the curves and does so with abandon. Hard braking is another sign of just how refined the Shelby is. The brakes clamp down on the road with the nose remaining centered. Push hard on the gas pedal again and the GT350 quickly rebounds and stays stable when cornering. Make a point to lower the windows when driving to take in the full chorus of hums, toots, bellows and attendant sports car noises. Although the Shelby’s cabin isn’t especially quiet, the dropped windows ensure you miss nothing. No, you can’t get a convertible with the Shelby. The Recaros ensure you stay in place when buckled in. My test model was a 2017 Shelby GT350 with a base price of $54,295 plus a $950 destination charge. You’ll also pay a $1,300 gas guzzler tax. 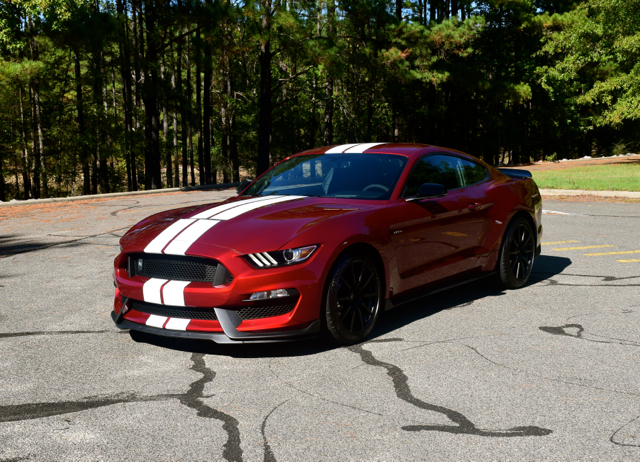 Upgrades included a ruby red metallic paint scheme ($395) and an over-the-top (roof) racing stripe ($475). A $3,000 Electronics Package added dual-zone climate control, voice-activated navigation, a CD player with satellite radio along with white striping with black accents. The final price was $60,365. These models return for 2018. The Shelby costs about $18,000 more than the GT Premium Fastback, the next powerful Mustang. That said, if you want some of the appearance and performance attributes of the Shelby, the gap narrows to less than $15,000. Suffice to say, by choosing today’s GT350 you’re investing in a Mustang unlike any other and better than any Shelby that has gone before it, thanks to flat-plane crank and excellent handling. Quad tips exhaust outlets and a raucous exhaust note. Oh, yeah!